Okay, so I know this is a bit strange and I though so too when I got the email but I'm an open minded and I have lots of free time and brain capacity since being unemployed so I though why not! 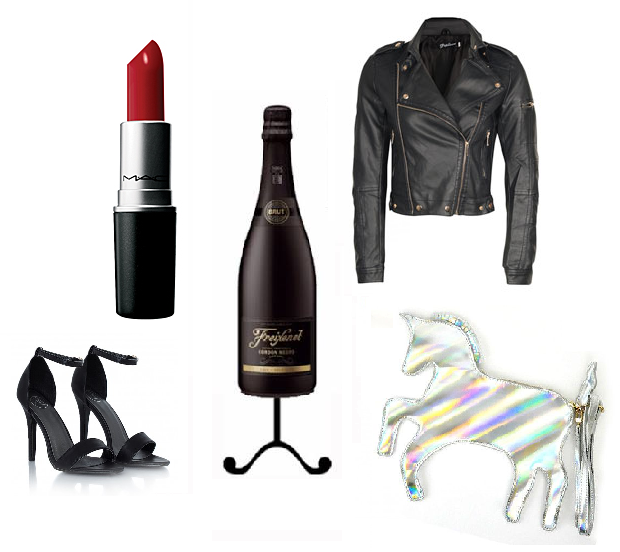 The aim of the game is to pretend this black bottle of cava from Freixenet is actually a LBD and I had to accessorise it! Here's what I ended up with! Clutch - How perfect is this thing?! Ive been wanting it for ages! I love anything holographic not to mention that it is also unicorn shaped! Shoes - Super classic, simple, good looking shoes from Missguided! Lipstick - OK, I dont wear lipstick but I just love this one, I know its popular among bloggers and it just adds a little bit of colour. I wouldn't wear it irl but to be fair if were thikning like that then you need to take a step back and remember that we are dressing a bottle here! Jacket - a little leather jacket to throw over the top brings it all together nicely! This one is from Boohoo.